If you’re like most people, you enjoy the summer here in New England but dread the insects that come with it. The worst insect, according to most New Englanders would probably be the mosquito and they’ve proved to be awful this year. People joke that there are really 5 seasons of the year, with the fifth being mosquito season. If you’ve ever been driven indoors by mosquitoes, we’re sure you know what we’re talking about. The irritating buzz of them around your ears and the constant swatting of these pests are enough to drive anyone crazy. Not to mention they are major vectors for such serious diseases as West Nile virus and encephalitis. But luckily for us, there are a few mosquito prevention techniques that you can employ on your property to help minimize the mosquitoes you encounter near your home during mosquito season. Eliminate mosquito breeding zones. This includes anything on your property that has standing water, like children’s pools, water tables and even bird baths and empty planters. Check for clogged gutters and drainage ditches. If these areas are clogged, water could be collecting and inviting mosquito breeding. Fill in any holes in the ground around your property and old tree stumps. These areas can collect water, which in turn invites female mosquitoes for breeding. Keep your lawn cut short and bushes trimmed so adult mosquitoes won’t hide in these areas. If you have an air conditioning unit installed in the summer, make sure that it drips away from your home and is not allowing water to accumulate. Following all of these prevention tips can help limit the amount of mosquitoes that breed on your own property, but unfortunately there can be mosquitoes breeding in your neighbor’s yard as well. You may limit the mosquitoes being hatched on your property, but you can do very little about the mosquitoes hatching next door. If you’ve followed all these prevention tips and are still finding mosquitoes to be unbearable on your property, that’s where Modern can help. Our mosquito control programs not only eliminate breeding sources but also include long-term prevention. 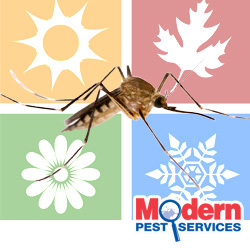 An effective mosquito management program, Modern Pest Services’ Homecare Mosquito & Tick program concentrates on inspecting and identifying mosquito breeding areas and then applying a treatment to your property to reduce adult mosquito populations and prevent further reproduction. Contact us today for more information on our Maine mosquito control, Massachusetts mosquito reduction and New Hampshire mosquito prevention services.